packed. check. e-course sign ups confirmed. check. TranquiliT shipping. check. tried on freshly delivered fall samples. check. above are 3 samples for fall. the middle one is my favorite! love, love, love. 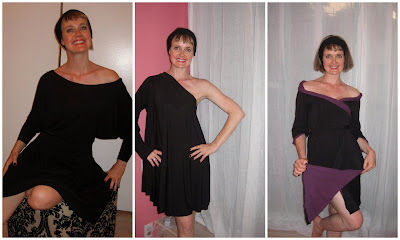 left is a 2in1 dolman top meets ballet skirt interpretation of this dress and the far right is the 3/4 reversible wrap dress in fall's plum colour. i've packed them for galivanting in LA as i always like to try new pieces out before finalizing. you like? another fave sample is a simple turtleneck. such a great staple - especially in this luxurious fabric. unable to come up with any birthday "needs" - or even wants for that matter - i stumbled across this sparkly, fair trade, fabulous tote made of reused materials in an e-blast and passed it along to beau. don't you love it? a must-have for moi. turning 37 never felt so sparkly. wishing you a sassy and sparkly rest of your week. i'll be sure to share photos and more from my return to the west coast toting tranquility. Oooh, especially love the center and right images. No lettuce edges? Break a leg in LA! like? i LOVE!! can't wait to purchase :) have a fabulous trip to the west coast. hugs!! love the dolman sleeve dress. i really appreciate any thing with shoulder straps! Very pretty! Will you be offering these silhouettes in some other colors? Would you consider a special order of a shape in a prior season's color? I have the long-sleeved wrap dress in mint, and it's too big for me! But I just love the color.